The National Council for Voluntary Organisations' UK Civil Society Almanac 2016 paints a complex picture of the voluntary sector. The latest version of the annual publication, which is based on figures for the financial year 2013/14, says the charity sector's overall income rose by 5.8 per cent over the course of the year to reach £43.8bn. The almanac, which is mostly based on the NCVO's analysis of charities' accounts submitted to the Charity Commission, shows that spending increased by 3.5 per cent to reach £41.7bn, making it the first time income and spending have both risen since 2009/10, the almanac says. But the impact of these increases has not been shared evenly across the sector, with the rise driven by the charities with the biggest incomes. "Super-major charities", defined in the almanac as having incomes of more than £100m a year, reported a 26 per cent (£1.66bn) increase in income, although this was partly due to a rise in the number of such charities, from 33 in 2012/13 to 40 a year later. Major charities, which are those earning between £10m and £100m, had a £500.6m increase in income, while large charities, those earning between £1m and £10m, brought in £337m more than in 2012/13. But income among small and medium-sized charities fell over the course of the year. Medium-sized charities with incomes of between £100,000 and £1m reported a combined 0.7 per cent fall in income, with small charities, or those with annual incomes of between £10,000 to £100,000, and micro-charities, defined as those with incomes of less than £10,000, experiencing falls in income of 1.7 per cent and 3.6 per cent respectively. The almanac says there was a 3.5 per cent increase in income from government in 2013/14, although this remains below the levels seen between 2007/08 and 2011/12. This growth in government income was, however, confined primarily to super- major and large charities, which reported increases of £447m and £131.3m between 2012/13 and 2013/14. Medium and micro-charities both experienced nominal increases, and small and major charities had significant falls in overall government funding, losing £24.7m and £56.1m respectively. Much of the increase in overall charity sector income was due to increases in money from individuals, the almanac says. The income charities receive from government is increasingly in the form of contracts rather than grants, the almanac says, which benefits larger charities instead of small and medium-sized organisations. Earned income from individuals, including fees for services and charity shop sales, was up 4.2 per cent to £10bn, and donations increased 7.7 per cent to £7.2bn. 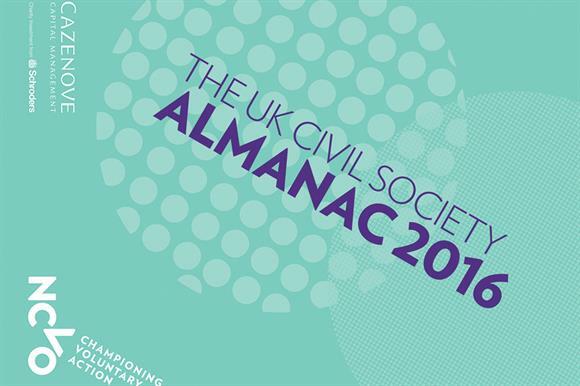 After the almanac's release, Rob Wilson, the Minister for Civil Society, tweeted that the NCVO's data "shows we are securing the charity sector for the long term". But Neil Cleeveley, chief executive of the local infrastructure body Navca, warned against making the "simplistic claim" that the overall increases in income meant charities were doing better.